The Masterol range of bakery release agents cover the entire spectrum of baked products, from yeast-raised to cakes, pies, biscuits and bars. Masterol’s range of traditional release agents is compatible with automatic pan spraying systems used throughout Australia and may also be applied manually. Masterol Foods’ Research and Development program is designed to ensure it stays at the forefront of release agent technology, delivering products which offer unrivalled performance, yielding superior quality and presentation. The Slipstream series is a result of this investment in R&D. Slipstream series products are designed to offer very high resistance to carbonisation and oxidation, while usage rates are only a fraction of those associated with traditional release agents. Products for specialist applications complement the range, offering outstanding results in applications where bakery release agents fail to perform such as the manufacture of meat, poultry and fish products. Bakerol Premium is suitable for release of most yeast-raised baked foods. Bakerol Premium Special is designed for applications which require higher release power. Slik Chik 303 was originally designed for use as an anti-sticking agent in the poultry processing industry. It prevents chicken skin from sticking to the surface of packaging or any other material with which product may come into incidental contact. Slik Chik 303 is bland in taste, so does not impart any unwanted flavour on the finished product. Clearbake is a clear (non-emulsified) wide tolerance release agent designed for the clean release of all kinds of bread and rolls, higher sugar content bread styles such as fruit loaves and buns, as well as in the manufacture of crumpets. 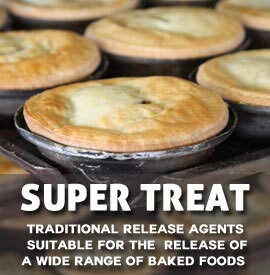 Super Treat is a traditional release agent suitable for the release of a wide range of baked foods. Super Treat NCX is designed for applications where a standard grade of release agent isn’t quite enough. Super Treat NCX10 offers dependable release of high sugar content products such as fruitcakes. Grillkote is designed to ensure release of meat, poultry and fish from conveyors used in continuous manufacturing operations. It features high heat resistance, minimising the build-up of sticky residue on surfaces to which it is applied. Twinkle is a release agent designed for application to tins and trays for the release of cakes, fairy cakes, muffins and other high sugar content products. Twinkle clings to the sides of individual cake cups and does not accumulate in the bottom of the cup, a characteristic which is achieved by a delicate balance of the right ingredients. Slipstream is a new generation of high stability, universal release agents designed to achieve clean release of baked foods including bread, cake and pastry from pans, tins and trays in all baking environments. Slipstream HR and Slipstream MR are low viscosity, liquid release agents suitable for spray application. 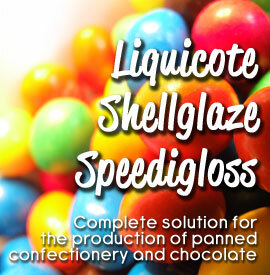 They are suitable for applications throughout the confectionery industry including being used as slab oils in the manufacture of brittle.